Over 180 coaches attended the 2013 Michigan Football Strength and Conditioning clinic, and this spring the staff will be hosting their second annual clinic on Saturday, April 12th in Ann Arbor, Michigan. The cost per person is $50 for online registration, $60 for walk-ups. Speakers will include experts in the industry and vendors from across the nation. This entry was posted in Uncategorized on March 14, 2014 by footballstrength_admin. 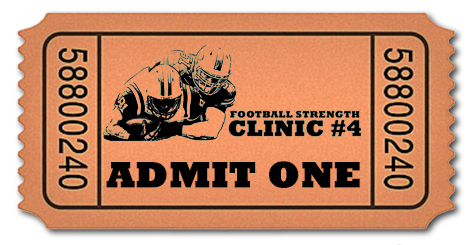 Online ordering for Football Strength Clinic #4 is now open. Please visit this page for clinic information and to purchase your tickets now. At Michigan, my head coach was Lloyd Carr and my position coach was Brady Hoke, but there was another coach, a guy behind the scenes, who was and is just as important: Greg Harden. This entry was posted in Uncategorized on March 3, 2014 by footballstrength_admin.